The very role of the ambient lighting is to set the mood and tone for the room. Its main characteristic is that it has no visible source. To help it in the mood setting the ambient lighting elements can be used in conjunction with other sensory factors: sounds, haptic feedback such as vibration or temperature and air flow. It can be used to enhance the experience of the home theatre setup with dynamic backlighting of LCD TV screens, for example. 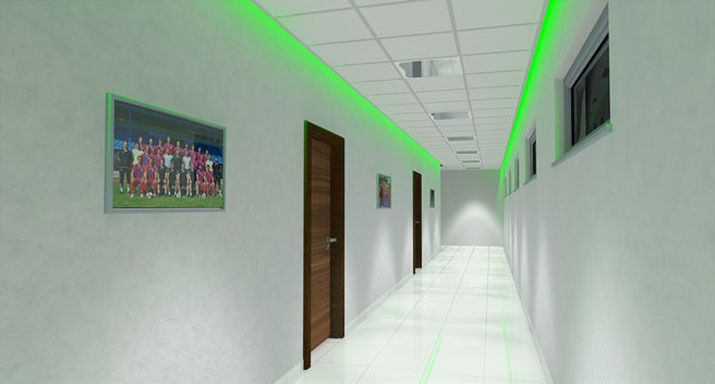 Several manufacturers provide their own ambient lighting solutions, where the colour of ambient light itself is affected by the colours of the scene on TV. The effect is provided by mixing and matching of built-in or external, computer-controlled LED lights. Further elements such as fans are added to enhance video games. These have to support the proprietary technology to fully utilize the possibilities. In interior design ambient lighting most commonly refers to the possibility of colour mixing, usually via RGB LED lighting. Its aim is to enhance feelings, not to achieve perfect colour rendering or optimal reading environment. Again, the technology allows using digital control to change ambient lighting dynamically to further enhance desired mood of the space. When illumination sensors or timers are employed, ambient lighting can change according to the detected lighting level or time of day. It can for example fade down (or up) when TV screen is turned on in an otherwise dark room. In interior design ambient lighting with hidden light sources can be used in recessed ceilings, allowing the refleced light from the ceiling to replace direct light. The same can be done in walls: recessed niches with quality luminaires installed are able to draw attention to certain parts of the room while luminaires remain hidden from normal view. Recessed ceilings are often used when renovating older buildings for either office or living purposes. While lower ceiling height is primarily used to decrease heating costs and hide technical installation, the construction is flexible enough to allow for modern lighting systems. These can cut down energy expenses even further. The ambient lighting in ceiling can be used for illuminating the whole space or just parts of it, if the area is too large or separated into spaces meant for different uses. In wall niches RGB LED elements can be used for great effect, as they can provide bands of continuous illumination. If fluorescent lights are used for this purpose, they have to be separated creating uneven lighting. LEDs have no such drawback.